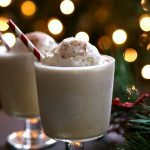 Eggnog floats are the perfect Christmas treat. Add a little brandy for a delicious winter cocktail or serve without for a tasty winter treat. Add ice cream to glass. Pour brandy and eggnog over ice cream.